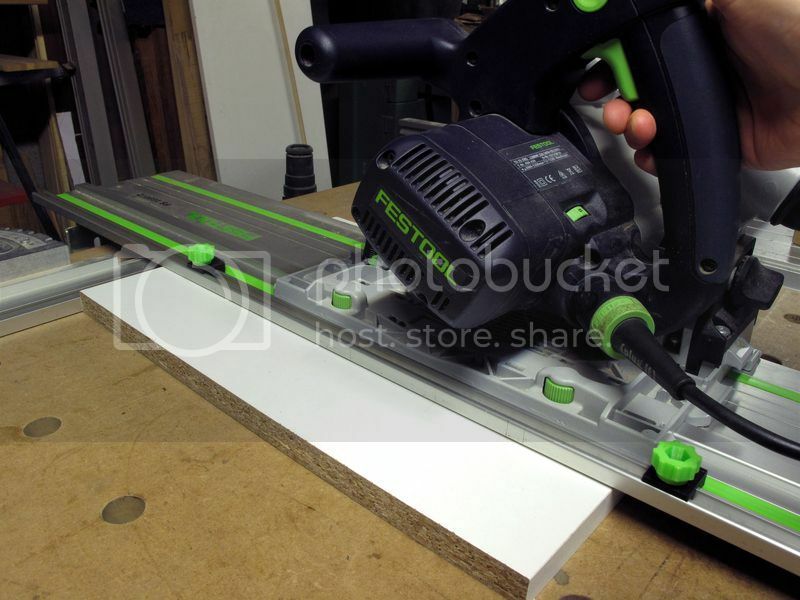 Until know I was using masking tape as stopping or starting marks on my Festool rails. I have a new project for which I will do a lot of repetitive cuts with the same measurements, and thought I'd better get decent stops for the job and stop messing with tape. 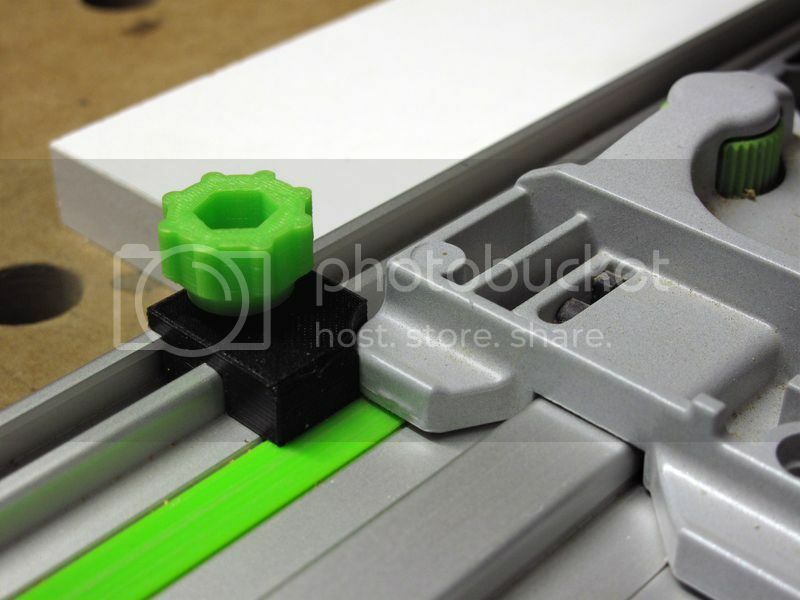 I've been playing with 3D printers for a while and felt confident enough to design and print Festool compatible stops by myself instead of buying them. At first, I modeled an MFT stop. It is very similar to the original one though I had to redesign it to make it printable. The steel bracket was cut in an old shutter hinge, and took some time to adjust and polish. 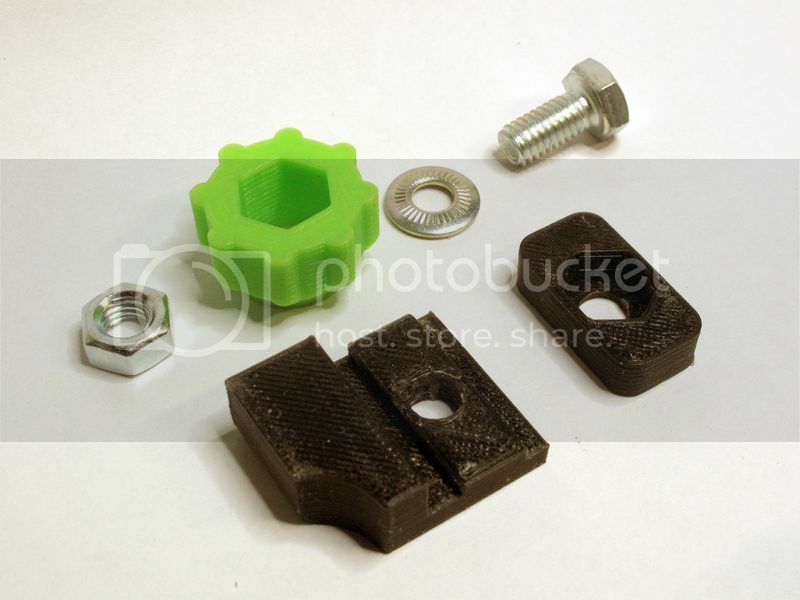 I did not use a square nut to secure the stop to the extrusion, but a standard M6 hex nut. Next day I worked on an FS stop. This time, as I don't have any original FS stop, I designed it from scratch. I tried to make it as small and simple as possible. 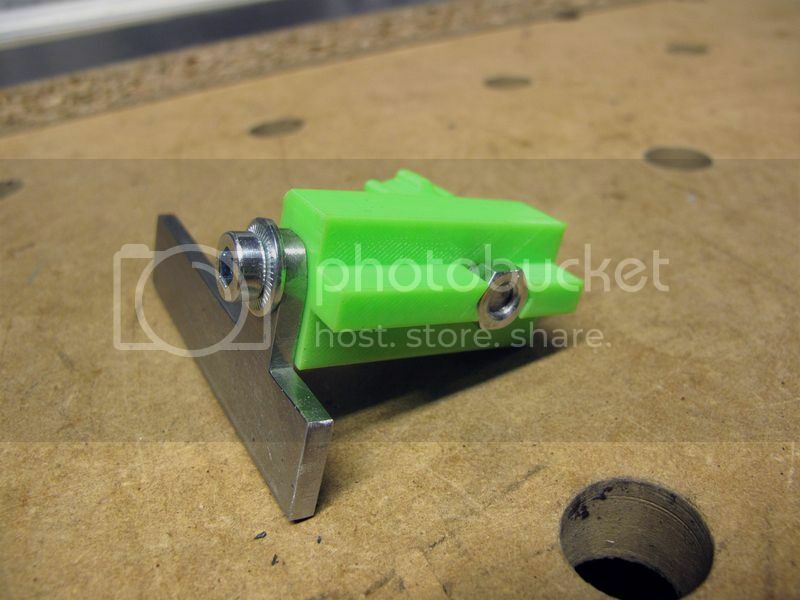 The extrusion being wider than the one of the MFT, an M6 nut cannot be used alone to hold the stop. Therefore, I added a plastic nut that traps the M6 one and grabs the channel without any risk of denting the aluminium. 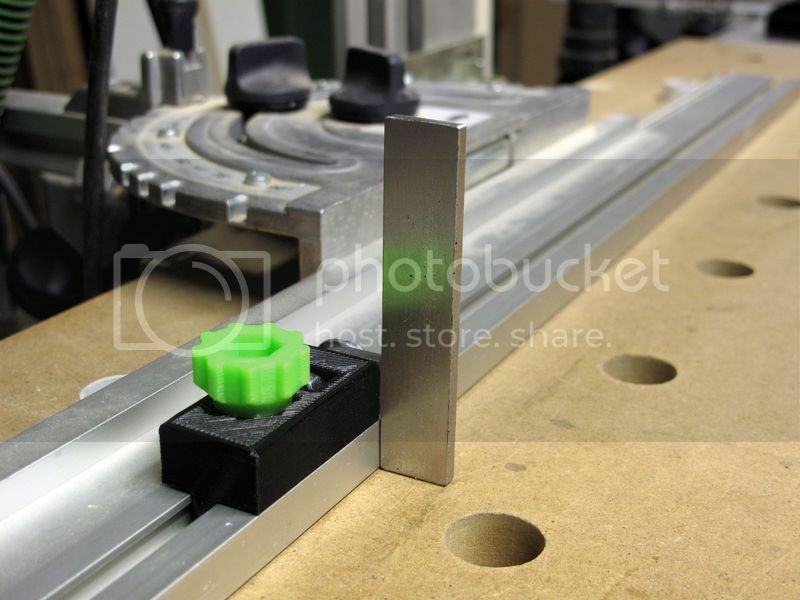 The stop catches the saw base at its corner so a round notch was added for better contact. Again, it worked fine and I printed a few of them for my other tracks. If you have access to a 3D printer, the 3D models and build instructions are detailed and shared on thingiverse. Wow, they look really good. And thanks for sharing the drawings, I might use m one day! Very cool!! Thanks for posting! I used them a few days ago for positionning the domino against the back of the rail, inserting them the over way round. Would you mind sharing what printer you are using? I have a 2.1 Foldarap (http://reprap.org/wiki/FoldaRap). Not a beast, but it has a good design and can achieve consistent prints if you take the time to tweak it (as any DIY printer). Finally had the time to dive into this, with perfect result. Looks great, something i'd love to get into. 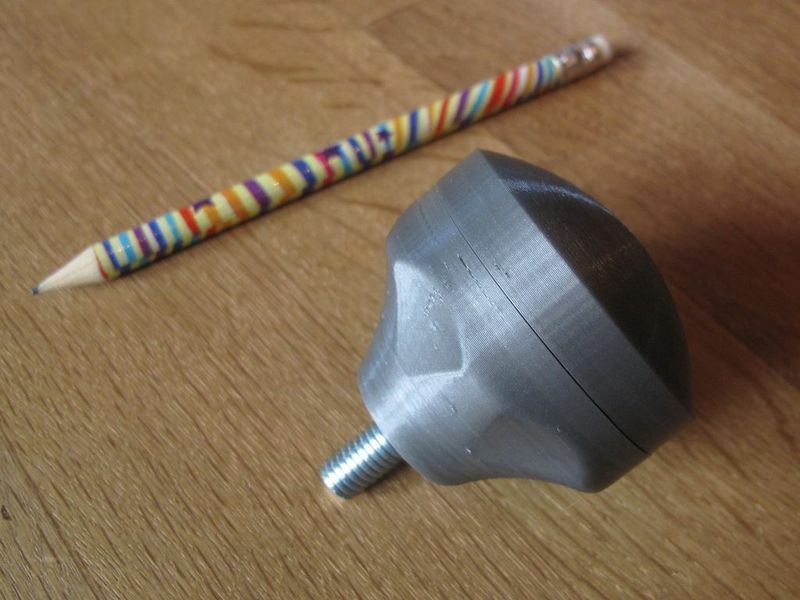 What sort of price are you looking at for an assembled or a diy kit to make stuff like this? I can consider making a few FS stops for those who are really interested (MFT ones require cutting tailored steel brackets, I wouldn't do that). I have to weigh them to see how much I can pack in a cheap padded enveloppe (say 100g-200g). Postage rates would be ridiculous for just two stops; I'd rather send 4 to 6 units per enveloppe to make it worth. What quantity did you have in mind ? Tom (Enrico74), why don't you list them on Shapeways? That way people will be able to order them, and you'll get a modest profit on your work. Very nice. Having spent most of my working life in 3D printing it's great to see its adoption outside big companies. You say you don't have an FS-stop to model yours from. The genuine stops have a small lip that rides over the tab on the back of the TS saws, so as to stop the saw lifting if it tries to kick back during a plunge cut. I agree with an earlier poster - things like this need to be on a site where we can all benefit from the design. 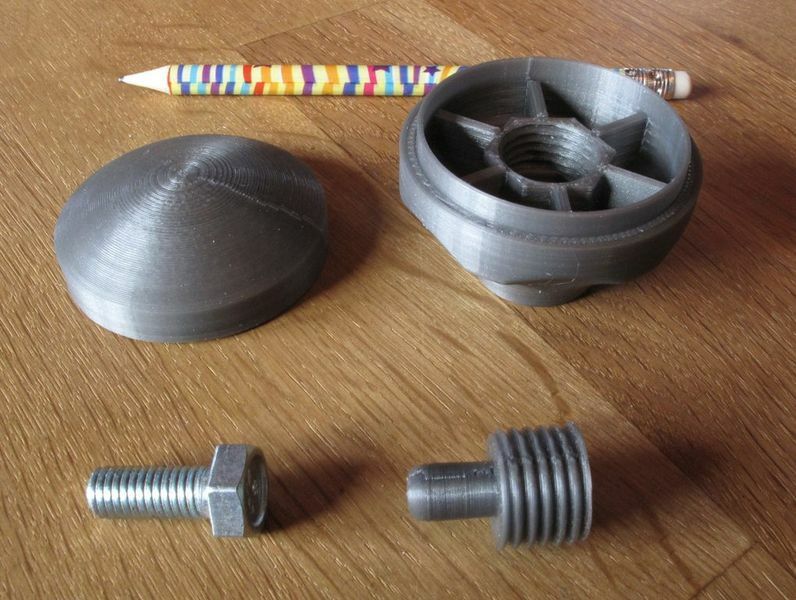 You need to have good CAD knowledge to really take advantage of 3D printing. Quality kits are more in the 500$-1000$ range and this is the option I chose. I already disclosed the design and CAD files on Thingiverse, anybody can use them (take a look at my initial post). Shapeways is rather expensive compared to my printing costs, I don't think it's worth compared to a genuine stop. I don't expect to make much profit out of these and won't be printing hundreds of units in my spare time. Though I can print a small batch for you guys that are willing to give it a try. These were great. Thanks for sharing. Here is another 3D print I just designed. This one is used to secure 20mm dogs or stops from the underside of the MFT. 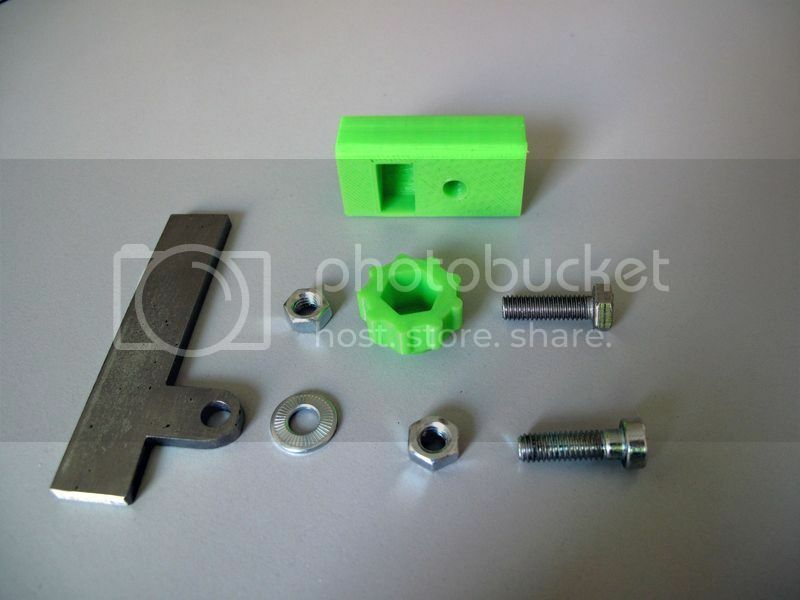 It's a combination of three printed parts (base, cap and threaded junction) and an M8 bolt.